Make sure you have enough gift cards. If you run low or want to offer holiday themed cards, we have 250K pre-designed cards in stock and the ability to print custom cards in house. We have same day printing capabilities and overnight shipping. We have 100K gift card holders in stock as well as specialty packaging. This enables merchants to make gift cards a complete gift. Customers appreciate the convenience. Have signage and gift cards on display at the register to increase gift card sales, especially impulse purchases. We have a large selection of Holiday POP signage and offer custom signage. Provide an incentive for customers to buy multiple gift cards. A gift card with purchase is a great way to achieve this result. For example, offer a free $5 gift card for every $25 gift card purchase. Ask every customer if they want to add a gift card to their purchase. Use social media and email marketing to let customers know that you have gift cards available. Provide the details of your gift card promotion. 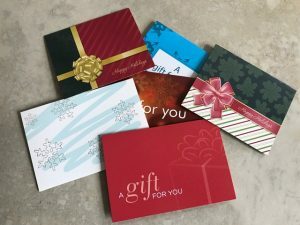 Mention gift cards in all marketing efforts. We wish you a successful Holiday gift card selling season! We are here to help you sell more gift cards. Contact us at sales@factor4gift.com or 484-471-3963 if you need to order gift cards, gift card holders, or need additional help. Follow us on Facebook, Twitter & LinkedIn for Gift Card & Loyalty tips. Visit: www.factor4gift.com to learn more. For media inquiries, contact Aimee DuCasse, Director of Marketing, Factor4.